There are a few options here. If you want to stay in mono black, you can look into dredge: Stinkweed Imp and Golgari Thug and Darkblast . In order to get these cards into your graveyard in the first place, you will need to include cards that allow you to discard. If you have the money for it: Collective Brutality is a fantastic way to do it. If budget is more of a concern then something like Dark Deal is ok but not great. 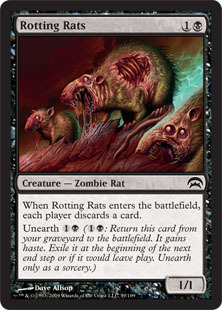 You could always use Rotting Rats to make your self discard (its also fine if you mill it, since you can just unearth it). One thing I just noticed is that you've got over 60 cards in the deck. It would probably be best if you kept to that 60 card minimum. This will increase the consistency of the deck overall. One way you could do this, if you like having a variety of different cards, is play a card like Mausoleum Secrets . This will allow you to just play one copy of niche cards like Distress , Liliana, Heretical Healer Flip, and Go for the Throat . You can also cut cards like Mind Rot and Ratcatcher (3 mana for that discard ability is too expensive, and 6 mana is definitely too expensive). If it were me though, I would just cut all the extraneous cards, not even bother with the Mausoleum Secrets and just focus on the rats. If you wanted to do multi color (it will be more expensive though). I would recommend a few cards. Red-black is the route I would take. You get cards like Faithless Looting and Experimental Frenzy . The looting is good for dumping cards into your graveyard. Frenzy is a combo card that allows you to keep playing cards off the top of your library as long as you have mana (and as long as it isn't a second land). If you want to go the frenzy route, I would recommend Nykthos, Shrine to Nyx as a good way to make a bunch of mana and cast a bunch of rats. This is kind of a different way to play the deck and might be too muddy with the self mill plan. So I would either choose the mill or the frenzy plan. Let me know if you have more questions. This deck looks rad. Oh, also Rotting Rats is pretty spicy. You can get a couple uses out of it's ETB but if you end up discarding it, it still has value in the graveyard when you choose to unearth it. Just something I thought I would add if ya don't mind, it's just a solid value card. Training Grounds is super good with this commander. Necromancer's Stockpile offers some good cycling power. Gisa and Geralf offer some good utility. Grave Defiler is good draw power. Herald's Horn card draw + cost reduction. Obelisk of Urd offers a large board buff. Josu Vess, Lich Knight, Kalitas, Traitor of Ghet, and From Under the Floorboards are just decent cards that can generate more zombies. 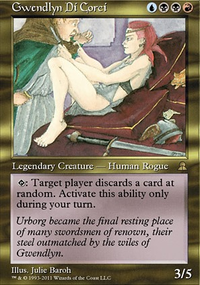 You clearly don't care about discarding cards as much as most of your opponents do so maybe a Rotting Rats. 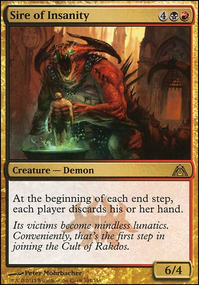 Seeing as how you seem to be going for Bolas flavor perhaps you could consider Hour of Devastation, Crux of Fate, Countersquall, Magmaquake, Neheb, the Eternal, Rakka Mar, and Soul Manipulation. Other sweet value cards you could consider are Discovery / Dispersal, Rise / Fall, Connive / Concoct, Angrath, the Flame-Chained, Liliana's Specter, Rotting Rats, and Burglar Rat.